Stems angled, reclining, 2 to 6 feet long from a perennial root, armed with recurved prickles. Leaves broadly hastate, long petioled, 1 to 8 inches long, pubescent or glabrous beneath, the apex and basal lobes sharp pointed; petioles and larger nerves prickly; peduncles and pedicels glandular; ocreae oblique, fringed at the summit with short bristles and at the base with slender prickles. 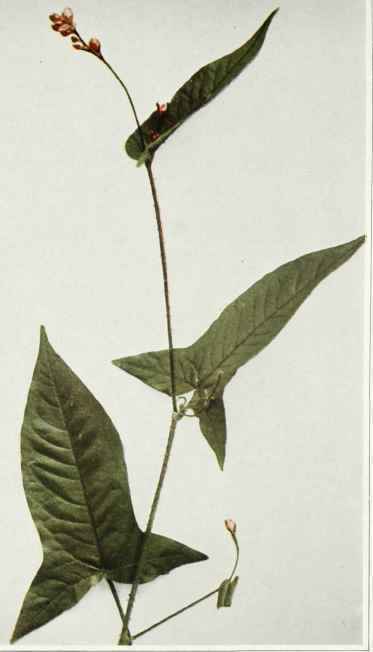 Flowers in terminal and axillary heads or racemes, rose-colored or greenish, four parted. Stamens six; style two-parted. In moist or wet soil and thickets, New Brunswick and Ontario to Minnesota, south to Georgia. Flowering from July to September.